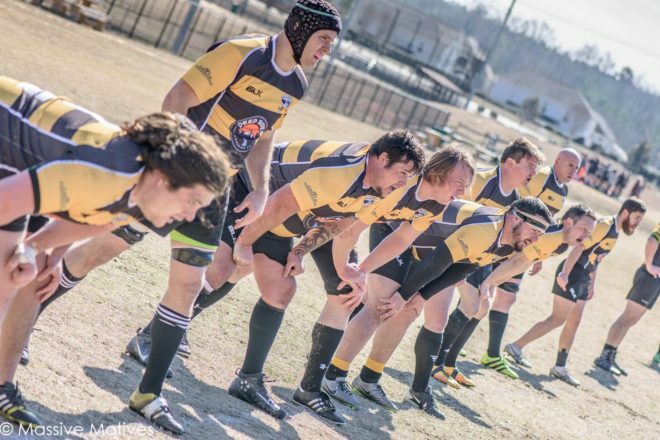 CLAYTON, NC – This past Saturday, the Clayton Bootleggers played host to Southern Pines in a pre-season friendly. With Clayton’s first Carolinas D3 North Division match of 2017 just a couple weeks away, the tilt against Southern Pines was one more chance to get in some much needed work. The brisk, but sunny February afternoon provided the backdrop for the rugby doubleheader with Clayton’s 1st XV taking the pitch in the opening match and the 2nd XV following against Southern Pines B. The home sides faced stiff odds as they took the pitch against a Southern Pines squad that has dismantled their competition this season and stand atop their division ready for another trip to the playoffs. The action started fast and furious with the Bootleggers taking the opening kickoff and pinning Southern Pines back into their own half. The Bootleggers pushed the ball within meters of Southern Pines’ goal line. A errand kick by Southern Pines was gathered by Prop Jeff Cosgrove, whom barreled over for the first score of the match. Flyhalf Brian Beauregard added the conversion to give the Bootleggers a 7-0 lead. Southern Pines answered right back to tie the match, but the Bootleggers countered with another. With a lineout on the Southern Pines’ 22, the Bootleggers got clean ball and used a well worked backline move to put Fullback Nick Russell who streaked in for the try. With the conversion, Clayton took a 14-7 lead. The first have was more of the same with the two sides going back and forth. Southern Pines notched the next two tries to take a 21-14 lead, but it wasn’t long before the Bootleggers evened things back up. After a yellow card to Southern Pines, one of three in the match, Clayton showed patience in working the ball deep into Southern Pines territory. Sighting a wrinkle, Beauregard stepped his way to the end zone and then converted to tie the match at 21-21. Southern Pines caught the Bootleggers napping on the ensuing kickoff and reclaimed the lead as the match went into the half with the visiting side leading 28-21. The second half kept up the back and forth between the two sides with Southern Pines pushing their lead out to 35-21 within the opening minutes. Clayton answered back with their fourth, and final, try of the match when newcomer Center Brian Anderson crashed over for a try to cut the lead to 35-28. Unfortunately for the home side, it was all Southern Pines from there out. The visitors locked down the remainder of the match, starving Clayton of possession and keeping up pressure. The constant pressure opened up in the final 15-20 minutes as Southern Pines began to find holes in the Clayton defense. With room to run, Southern Pines were clinical in pushing lead. When the final whistle blew, Southern Pines claimed a commanding 68-28 win. While not a win, it was a much improved effort for the Bootleggers, whom have worked hard to install a new offensive/defensive scheme. The entertaining first match was followed by the Bootlegger’s 2nd XV taking on Southern Pines B. The two sides produced a fun match to entertain the crowd. Just as in the first match, Clayton came out and surprised Southern Pines by holding strong in the first half. Southern Pines jumped out to a 14-0 only to see the Bootleggers get converted tries from Adam Garner and Anthony Crumity to give Southern Pines took a narrow 19-14 lead into halftime. Looking for an upset, the Bootleggers struck first in the second half to take a 21-19 lead when Doug Stillwell scored to give Clayton the lead. Southern Pines stormed back into the lead with about 20 minutes to play and tacked on a couple more tries in the last few minutes to pull away for good with a 35-21 victory. The performance from the 2nds was encouraging as the improvement from the Fall was noticeable. The 2nds included a lot of fresh faces that are beginning to challenge for playing time. The result was one of the best 2nd XV performances to date for the Bootleggers. The Bootleggers return to action on February 25th when they travel to take on Fort Bragg in a Carolinas D3 North Division showdown.